The FORKS OF THE CIMARRON: EAST-MIDDLE-WEST: If you love chasing wild fish in small rivers, this is your place. At an elevation of 9,600 feet, each fork is located in their own high alpine valley. All three have an abundance of pocket water, small pools and riffles, all coupled with exceptional views. Great hatches can be expected throughout the summer and into fall. These rivers are a dry fly fisher's dream and are also great for Tenkara. Happening Now: Winter has Grasped the High Country and will hold on until spring. As Conditions become warmer we will keep you posted on the amazing fishery. Recommended Gear: 9' to 12' Tenkara rods or shorter and lighter fly rods in the 2 to 4-wt. range work best. BIG CIMARRON: This section of the Cimarron is below Silver Jack Reservoir and offers several miles of uninterrupted and remote fly fishing opportunities. Technically this is a tailwater but it doesn't fish like one. When flows are below 60 cfs, shallow dry/dropper rigs are the rule. However, for the deeper pools or during higher flows, deep nymphing will produce the biggest fish. Casting can be tight, with lots of vegetation and limited trails along the river, so be prepared to "earn it" in order to access this section. Happening Now:Big Cimarron below Silver Jack Is a tail water but with less flow in the winter it will ice up but if you still want to head up there try nymphing the deeper holes and runs will produce fish but with some snow up high be sure your prepared for colder weather. I would look to other Fishing options until spring kicks in. Recommended Gear:Fishing dry flies, use 3 to 4-wt. fly rods with a soft/slow dry fly action. Also, 13' Tenkara rods with a stiffer 6.4 action or better will work well. EAST PORTAL: The East Portal is located at the upper end of the Black Canyon inside the Black Canyon National Park. This is the only access point into the Black Canyon in which you can drive directly to the river, and is subject to seasonal closures. Once you are down on the Gunnison River you are surrounded by towering granite walls some as high as 2,000 feet. The East Portal is a classic western tailwater, and a gorgeous place to visit. Happening Now: The Road Closed for the Winter!! GUNNISON GORGE: This is a magical and beautiful place to fish, especially float fishing! Most famous for the Salmon Fly hatch in May/June. This is a great section of river if you want to get away from the crowds of the East Portal or lower sections around Pleasure Park. The only access to the Gunnison Gorge Wilderness section is by hiking one of the four trails or a Three Day Float fishing Trip with RIGS. Happening Now: The Gorge is fishing OK but with colder weather and snow you will need to watch the roads. Most will not be accessible until the snow stops. The main Bug this time of year is midges but, don't be afraid to throw some larger flies as your lead. Nymphing is your best bet if you do hike down into the Gorge. Recommended Gear: A 9' to 10' 6-wt. fast action fly rod, with a high sensitivity large arbor reel and solid drag system will give you the stopping power to fight big rainbows and browns. Heavier tippet in the 2x to 4x range can always be fished in the "Gunny Green" waters and will be needed especially when float fishing the technical waters. Most Productive: Nymphing with smaller attracter nymphs or Larger Caddis larva trailing BWO's and midge larva can be highly productive. 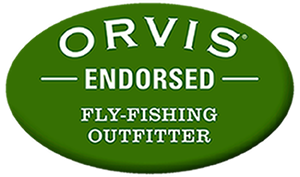 Dry fly fishing with BWO's may entice rising fish. Look to make longer cast to rising fish as they can be spooky this time of year. PLEASURE PARK: This stretch of the Gunnison starts at the confluence of the Smith Fork, four miles above Pleasure Park, and ends at the Highway 65 bridge about 12 miles below Pleasure Park. Not as dramatic as the East Portal or Gunnison Gorge, this section of river twists its way through sandstone cliffs and beautiful desert landscape. Happening Now: Fishing is very good above Pleasure Park, but with the warming weather the North Fork of the Gunnison is to high to wade across. Access the river from the south side and fish upstream of the confluence. Fish are looking to feed and seem not to be to focused on what the pattern is. BWO hatches have started and the fish are looking up some in the riffles. Its more about getting the fly into the fishes feeding lane. Use a heaver nymph to help get down and trail it with other small flies like midges and BWO nymph patterns. Recommended Gear: 5 and 6-wt. fly rods, 9' to 9' 6" with a matching fly line and a reel with a good drag system for fighting big fish. Most Productive: Nymphing with Stonefly patterns, mayfly nymphs and midges trailing behind. Larger stoneflies can also be a great lead fly for sinking those smaller midges. You may find some fish rising during the warmest part of the day and we have found the mole fly to be very productive dry pattern when trailing off and easier to see BWO adult. Streamers:Slow Presentation on streamers may produce a fish in the colder months but nymphing will be more productive. SAN MIGUEL: The stretch of the San Miguel just downstream of Telluride meanders through meadows and trees, and provides a prime example of a Colorado freestone river. The river changes a few miles downstream with some bigger and faster water. Pocket water is abundant with a few long runs and deep pools. In the summer fishing both tight to the banks as well as around cover can produce solid fish. Happening Now: Its Spring time on the San Miguel and the water is high . Water level coming up, making larger bright flies the most productive but again the water is muddy. Recommended Gear: This river is perfect for lighter weight fly rods in the 3 to 4-wt. range and also Tenkara rods. Tenkara rods are best from 12' to 13' in length and 6:4 (medium) flex. A floating Tenkara line will allow you to fish dry flies with ease. Most Productive: Hopper Dropper rig through the deeper cut banks, slow riffles. Water Clarity: Clear/Low Watch for rain the day before witch will cause the water to muddy up. But we see it clear up really quickly sometimes even later that day. UNCOMPAHGRE RIVER AT PA-CO-CHU-PUK: "Pa-Co-Chu-Puk" or just Paco, is the section of the Uncompahgre River that lies inside Ridgway State Park and is a fly fisherman's dream. It is one of the best tailwaters in the state and holds fish well over 10 pounds. Paco offers easy access for beginners or those with mobility issues, and is a year-round fishing destination with great hatches throughout the year. This is one of the best places to throw dry flies during summer. July through September can be on fire with Caddis, Green Drake and PMD hatches! Happening Now: Fishing at Paco Chu Puk has been steady with the water clarity being excilent. Flow's have come up from winter levels slightly, so anglers must practice stealthy approach. Dead drifting leeches or Mayfly nymps and a midge, primarily red, combo has been working the best. Bigger fish will NOT move for your flies therefore sight fishing must be practiced. Move slow and take your time in each hole to make sure your not spooking any fish. Best Time to get on the water is between 9:30am-3:00pm once the sun is behind the ridge the temp drops fast. Recommended Gear: 5 and 6-wt. fly rods, 9' to 9' 6" with a matching fly line and a reel with a good drag system for those big fish. Most Productive: Light tandem nymph rig with leeches and midges. Let our fish report get you out on the right water with the right gear, or stop by the shop for the most current regional flies and offerings from Simms, SAGE, Patagonia, Abel and more. Book a walk wade or float fishing trip online with the most professional guides in the region. If you are planning on fishing in Colorado this year, RIGS “Reel Time” fishing report includes up to date information on conditions, flows, flies, a hatch guide, weather, maps and more. RIGS Colorado fishing report is regularly updated and provides all the information you need for fly fishing on the Gunnison River (Black Canyon National Park & Gunnison Gorge), San Miguel River, Uncompahgre River & Cimarron River. Fishing in Colorado has never been better, especially in the Southwestern part of the State. For more information on the regions top fly fishing destinations along with the best Colorado fishing report, come by in person or visit RIGS Fly Shop online. We are located in the heart of the San Juan Mountains in historic downtown Ridgway within one hour of Ouray, Telluride, Montrose and Silverton Colorado. If you are fishing in Colorado, RIGS fish report will keep you up to date on all of the happenings in the region.